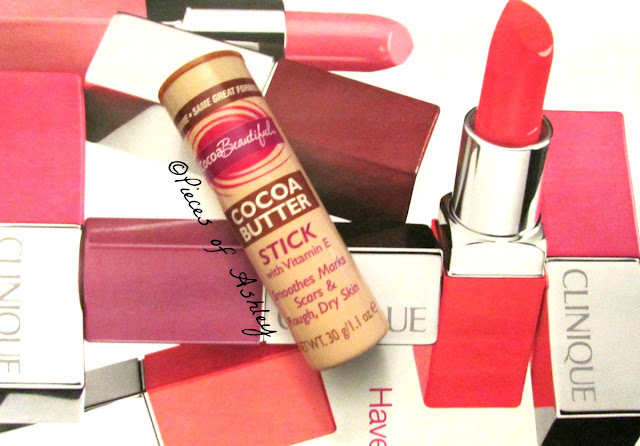 The Cocoa Butter Stick is Pure Cocoa Butter infused with Vitamin E that moisturizes rough, ashy areas. Great to use for marks, blemishes and scars. This smoothes on easily to the skin. I think is a good product to use. It applies to the skin very well and most important it absorbs into the skin pretty quickly. A little goes a long way. The first time I used this I put to much, which made it take a little longer to absorb. I tend to experience dry skin sometimes so this very helpful. This is a very versatile product you can use for blemishes, dry skin, and marks. Right now I am using it for blemishes and marks left from bumps. It's very important for our skin to stay moisturized and hydrated, not just for the winter months but also the warmer months to. I do not really experience a lot of dry skin, expect for in between my fingers and towards my elbows. I have used cocoa butter in the past and it was helpful but I wasn't really consistent with it. But while in Walmart I saw it for less than $2, so I knew I had to try it. The Cocoa butter stick has Vitamin E in it. As I have mentioned in other posts of mine this Vitamin is one of the essentials for making skin look healthy and refreshed. So I definitely recommend this product and you do not have to use it for one thing, it is used for multiple reasons which is great. I hope you enjoyed reading! Have you tried this product before, or any other Cocoa Butter product? i don't think i've ever tried any cocoa butter products, this sounds really nice!